A greasy oil slick in a white marble baroque building sounds like the makings for disaster, but Swiss artist Romain Crelier successfully combined the two strikingly different components in the beautiful La Mise en Abîme art installation. 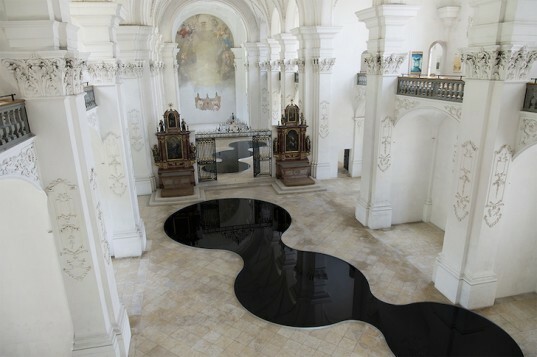 The contemporary piece comprises two large puddles filled with used motor oil that sprawl across the floors of the Swiss Abbey-church of Bellelay. The black pools create mesmerizing reflections of the building’s ornate baroque architecture. 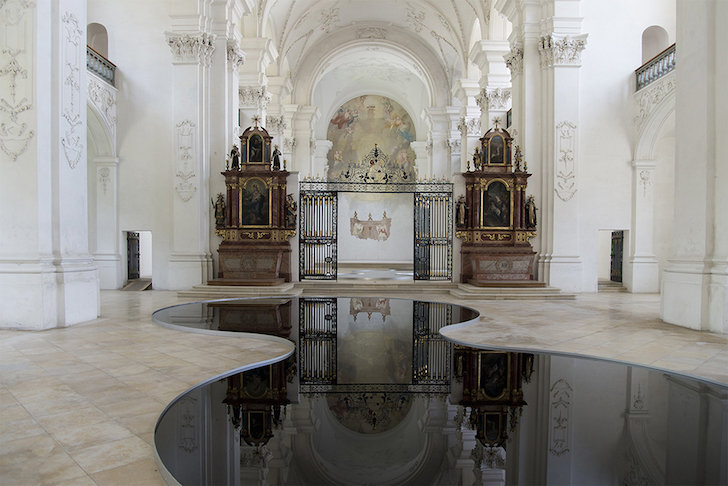 Created for a 2013 summer exhibition, the La Mise en Abîme installation translates into “a work of art contained in another work of art.” The shiny black surfaces of the two large pools draw viewers to its edges until their reflections become part of the artwork. The still and lacquer-like oil surfaces explore the relationship between form and void. The shapes of the reflective shallow pools take on an organic, puddle-like shape to provide contrast with the symmetrical architecture. “The installation not only dispenses multiple visual thrills and mysteries but also offers a moment where sculpture creates another reading of space,” writes We Find Wildness. The shiny black surfaces of the two large pools draw viewers to its edges until their reflections become part of the artwork. The still and lacquer-like oil surfaces explore the relationship between form and void. The shapes of the reflective shallow pools take on an organic, puddle-like shape to provide contrast with the symmetrical architecture. “The installation not only dispenses multiple visual thrills and mysteries but also offers a moment where sculpture creates another reading of space,” writes We Find Wildness.